Watergate, Sisyphos, Tresor, Berghain – Berlin clubs that go all night or, sometimes, an entire weekend. They highlight the popularity of electronic music in Germany’s capital city. Many Berliners don’t see house and techno as mindless. “Doof doof”? Nie! These clubs, and the DJ scene that has grown around them, continue the lineage started by German electronic music pioneers Karlheinz Stockhausen, Neu!, Tangerine Dream, Can, Popol Vuh and Kraftwerk. Electronic music clubs aren’t fringe activities in Berlin either. They are fundamental to the city’s cultural landscape. In a landmark ruling late last year, Berghain’s techno parties were classified by the Berlin-Brandenburg fiscal court as cultural events; as important as classical concerts. Record collectors like yours truly don’t have to journey too far to see just how Berlin’s love for electronic music shapes its second hand vinyl scene. 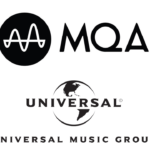 With many of the world’s most respected DJs either living here or visiting on a regular basis and with new electronic releases having a short shelf-life out on the dance floor, records are turned over quickly to second hand outlets, often so that DJs can fund newer purchases. 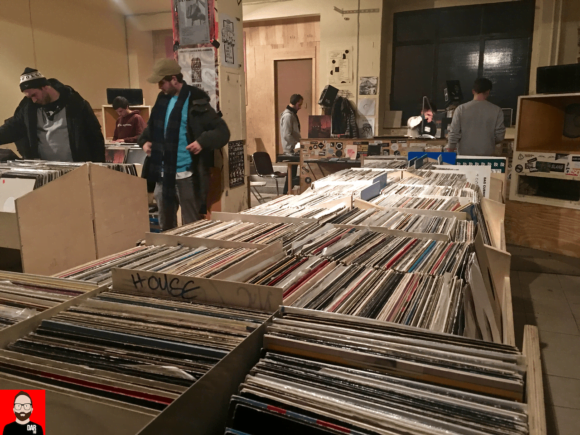 Then there are DJs moving wholesale from vinyl to a laptop or a pair of USB sticks – they have to clear their old vinyl collections somewhere. 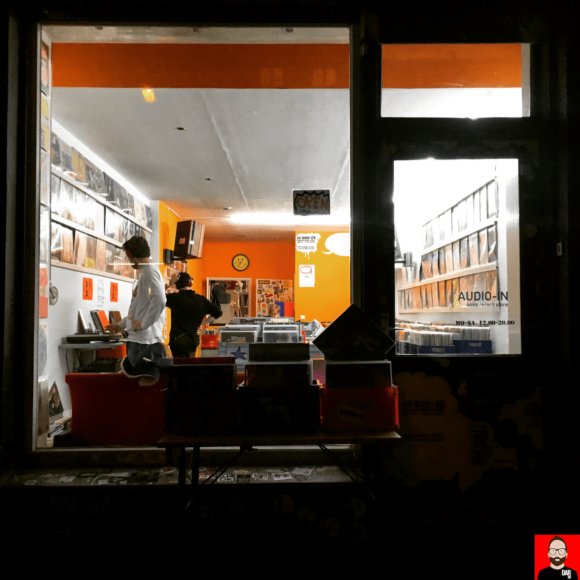 That somewhere could be Friedrichshain’s Audio-In; a small record store (‘Plattenladen’) situated ten minutes’ walk from Berghain and Warschauer Strasse U+S-Bahn and loaded with used vinyl that runs the gamut of electronic music’s sub-genres: IDM, house, techno, drum n’ bass, dubstep. Lining the walls are big ticket rarities, including some rock and indie. This store knows what it has when it has it – rare Hawtin and AFX included – and prices it accordingly. That doesn’t mean you’ll walk away feeling short-changed. Look to the floor for bargain bins filled with DJ promos and some questionable 90s releases. A discount box in front of the counter yielded Spooky’s Shunt EP for €5. That somewhere could also be The Record Loft, sat back from the main drag in Kreuzberg behind a glass-walled coffee shop that many locals point to as a sign of the area’s ongoing (and sometimes fiercely paced) gentrification. The G-word has been waved around as the reason for The Record Loft’s abrupt closure at the end of 2016. That’s a shame, not only because of the hours one could spend digging through bin after bin of used 12”s and LPs (I grabbed Orbital’s The Box for €5) but also for the store’s audiophile-grade sound system. Sourced from a collector in Italy, an enormous pair of vintage Altecs gave voice to everything from Ricardo Villalobos to New Order to Dire Straits during my two-hour visit. One problem for collectors looking to play these records on a better-than-average turntable back at home is a four-letter word: dirt. Many of these second hand finds have seen DJ booth action which means everything from grubby fingers to drink spillages have possibly left their mark deep within a record’s grooves. Sometimes this dirt is visible to the naked eye but most times it isn’t. Why care? In the long-term, dirt spells unnecessary wear and tear on the cartridge’s stylus tip. In the here and now, it means more audible surface noise. Enter Pro-Ject’s VC-S. VC = vinyl cleaning but S doesn’t mean ‘system’; it’s this cleaner’s position within the manufacturer’s four product ranges: S, DS, DS2 and RS. This leaves room for Pro-Ject to build more luxurious cleaning machines in the future. A utilitarian black box and selling for €449 puts the VC-S right into OKKI NOKKI territory, a record cleaner that did the dirty work back in Sydney. Both are vacuum-based designs: mount the record, apply the cleaning fluid, put wand to surface, engage rotation rocker and fire up the internal vacuum system. The fluid and any dislodged dirt is then sucked from the record’s grooves. Empty the VC-S’ internal tank as required; a ‘MAX’ marker tells us when. 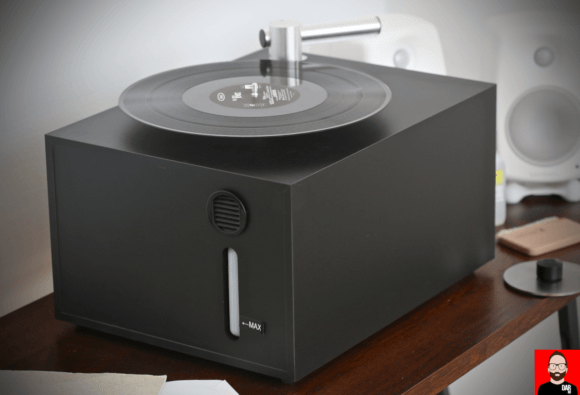 On performance comparisons between OKKI NOKKI and Pro-Ject DC-S, I know not. What sets the Austrian apart from its Dutch rival is a faster spin speed (30rpm) and a metal suction wand. On vacuum cleaner noise, each are equally loud. Those sensitive to such things should consider a Spin Clean or an ultrasonic option. Be advised that the latter will dig deeper into your bank account. Back to the VC-S. 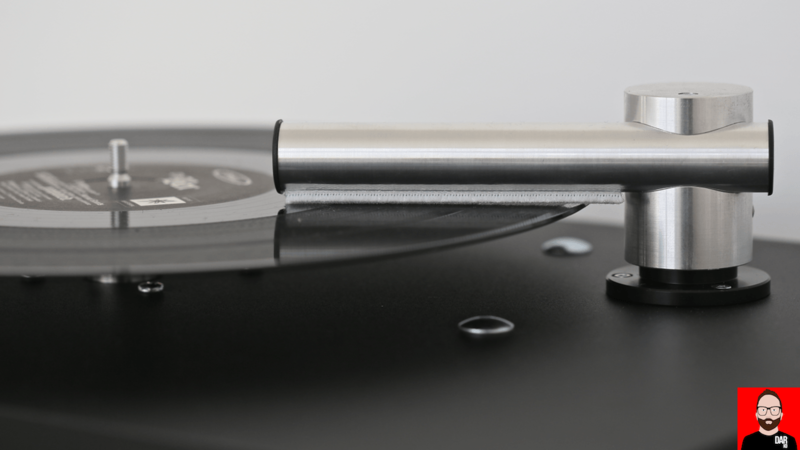 Skip out on the Pro-Ject’s instruction manual and an important setup detail will easily be missed: the supplied cleaning fluid requires somewhere between 10:1 and 20:1 dilution with distilled water. 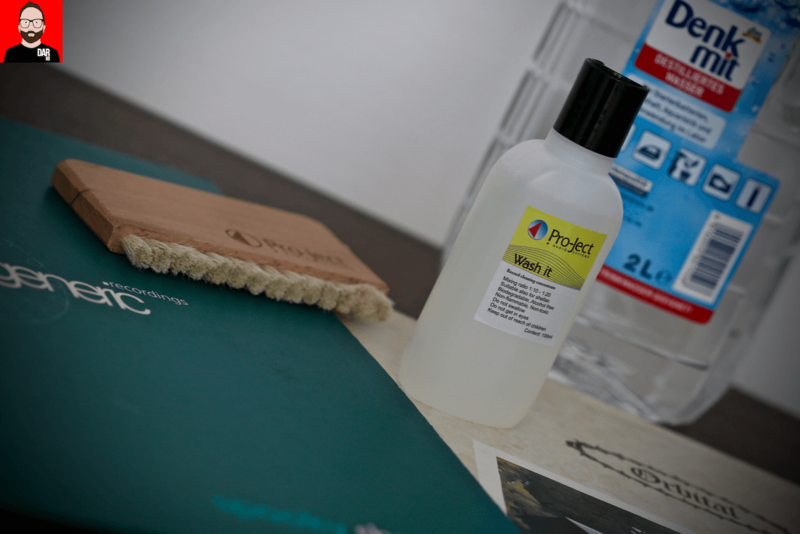 The 100ml sample of Pro-Ject’s cleaning fluid included with the VC-S is reportedly good for 100 records. Refills are available separately in three additional sizes: 250ml, 500ml and 1 litre. 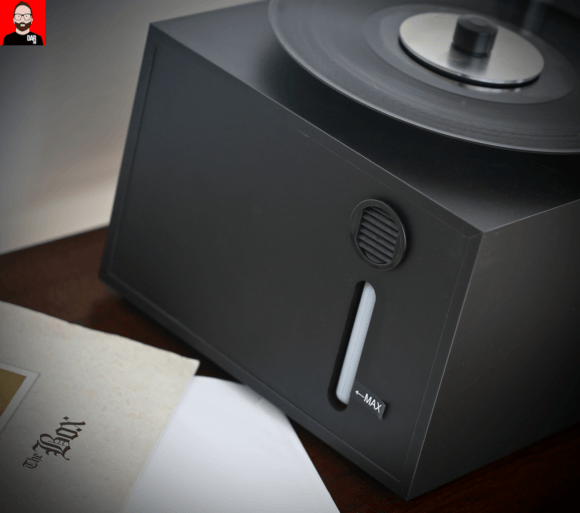 Without a full size bottom plate on the VC-S we must take a little extra care when applying the fluid to the record’s surface with the manufacturer-branded goat hair brush (supplied) – downward force should be minimised. The wand height is adjustable but the factory-set default proved AOK for my needs: cleaning up the Orbital and the Spooky. 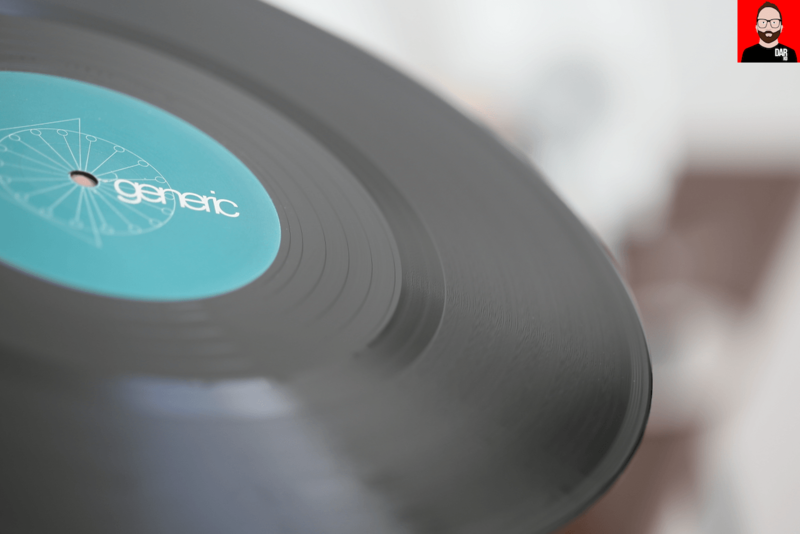 With wand kissing the record’s surface, Pro-Ject recommend a full spin in both directions. I went with two. Cleaning each side takes less a minute. In this respect, the Pro-Ject cleaner is faster than the OKKI NOKKI. It’s for people in a hurry. Or perhaps those who lack patience. Records emerge from the VC-S almost dry and can be played almost immediately. 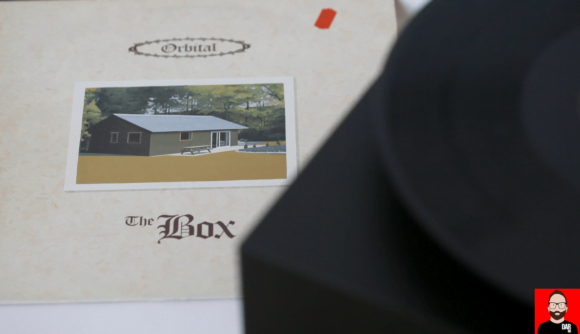 Prior to cleaning I ripped the first twenty seconds of each record’s opening side to a FLAC using Audacity. 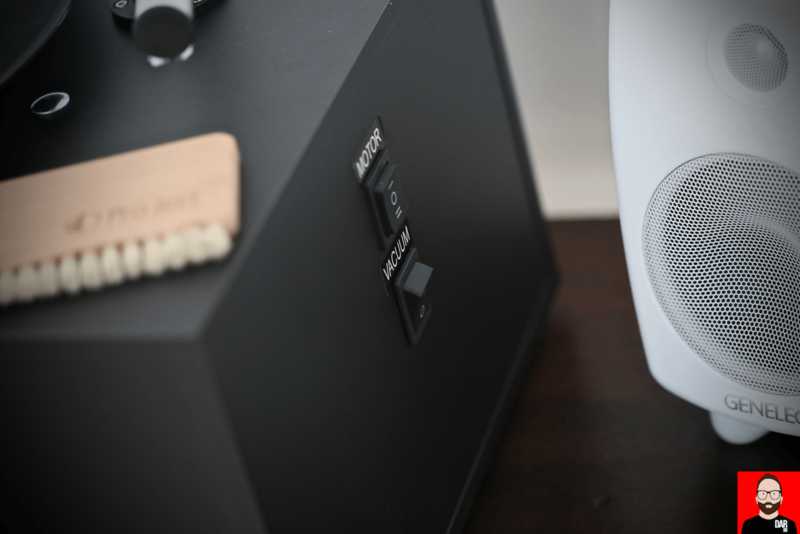 The hardware chain was as follows: a Pioneer PLX-500 fitted with the DJ-centric Ortofon Nightclub MKII and lassoed to a Macbook Air with AudioQuest Carbon USB wire. No file normalisation was applied. Once cleaned, “After” files were generated in the same fashion. The audible differences between the Orbital 12”’s “Before” and “After” weren’t of sufficient magnitude for me to conclude positively (and without doubt) in favour of the Pro-Ject cleaner. (That came later). Readers can listen to the “Before” rip here and the “After” rip here. The Spooky 12” proved to be a different deal entirely. After cleaning, the amount of audible surface noise dropped significantly which in turn made it a much more enjoyable listen. Readers can listen for themselves: the “Before” is here and the “After” here. 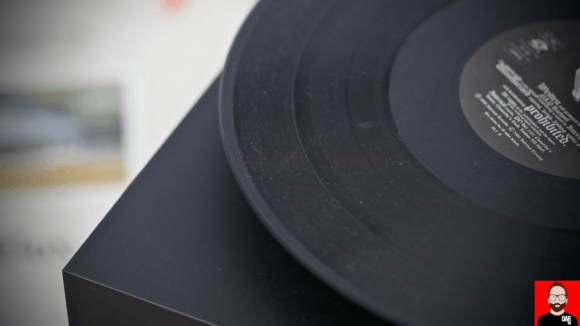 The results with the Spooky 12” are more typical of the average VC-S clean than the Orbital 12”’s results. However, cleaning the Orbital wax a second time lowered the surface noise further still. Again, impressive! 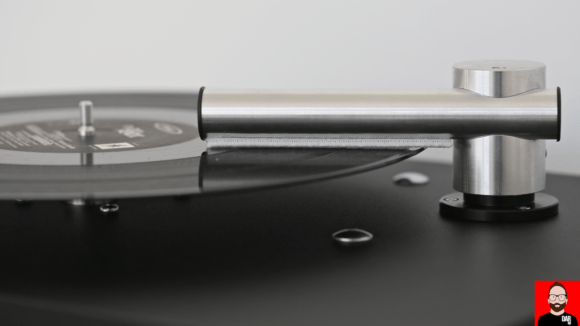 This makes Pro-Ject’s VC-S record cleaning machine (and fluid) a must have for any crate digger serious about returning previously DJ-d vinyl to home-playable condition. 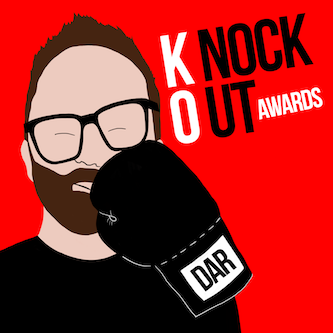 A no nonsense DAR-KO Award goes out to Pro-Ject for a no nonsense, easy to use and highly effective appliance. DIY ultrasonic vinyl cleaning solutions don’t seem to be prohibitively expensive. That’s because the user pays partly with time and skill in building it. Hence DIY. Thanks for that review. I was curious. I hope Pro-ject is considering quieter machines in the future.